Our aim is to make your event memorable and leave your guests raving about your impeccable taste! 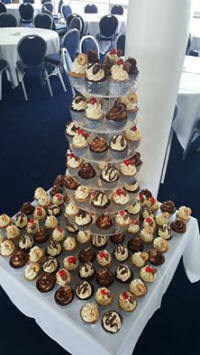 Not only do Wow Cupcakes look Wow, they fill the room with the most wonderful aroma and taste utterly divine! 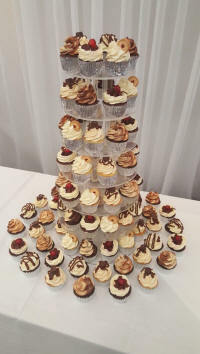 display on our 7 tier cake stand. We except wedding/party bookings a maximum of 3 months in advance, if you decide you'd like to book Wow Cupcakes to cater for your wedding or party we ask for 50% non-refundable/non- transferable deposit which secures your date, the balance is then payable on collection of your order from Lordswood, Southampton the evening before your event, we will show excally how to set up the cake stand. Bookings are only confirmed with deposit payment and we reserve the right to continue taking orders for any given date until payment has been received. Please send us an email with your wedding/party date and number of expected guests to check availability.